Dubai: An Emirati man has protested that the developer of the world's tallest tower, Burj Khalifa, refused to let him trek the stairs for charity, while allowing the ‘French spiderman' to climb. He also claimed that his attempt had been met with ‘a lack of interest' followed by refusal by the tower's management. Jalal Jamal Bin Theniyah, 25, said he has been climbing the city's various towers, using the stairs, to raise money for charity and bring the issue of people with special needs to the forefront. Bin Theniyah raised his case after Gulf News reported that Alain Robert, dubbed the French Spiderman, was set to climb Burj Khalifa on Monday for the opening of the Higher Colleges of Technology's (HCT) 10th Education Without Borders (EWB) Conference. Bin Theniyah said when Burj Khalifa, managed by Emaar Properties, a Public Joint Stock Company (PJSC), was in its finishing phases in 2008, he approached the management to ask permission to climb the stairs of the tallest building in the world to raise money for charity. "Since 2008 I had approached Emaar regarding permission to climb Burj Khalifa. I had attempted the conventional method of approaching their marketing company first, this failed. After several attempts, I contacted friends who were within the chairman's circle in order to get the message across to him. This as well ended up in failure as the recession had hit the UAE. During the last quarter of 2008, I attempted to contact the management again." He claimed this time being ignored, he created an online petition which brought some attention but ‘was easily dismissed by Emaar'. Ahmad Al Matroushi, managing director of Emaar Properties PJSC, told Gulf News there were discussions with Bin Theniyah regarding his attempt last year, but a misunderstanding took place between the two parties. "I am not aware of the details of the misunderstanding, but the group who dealt with him said they would not like to get into any other misunderstanding or problem again. He was not denied just like that," Al Matroushi said. He also said it is not true that Bin Theniyah was denied because he is an Emirati. "This is not true. However, an owner of a certain property is free to decide about his property," he said. Bin Theniyah said: "During the last quarter of 2010 I was promised we would go ahead in the month of April, again I was delayed until October and then the petition was made as I was told the event would not happen," he claimed. He said the final word from Emaar management regarding his request was no. "They told me that this will not happen. After much delay they just refused. This made me angry. They told me they wanted international figures. What is the problem with an Emirati wanting to be a part of a tower down the road from his home? Why did someone from France get the green light before an Emirati who publicly is asking to do charitable work? 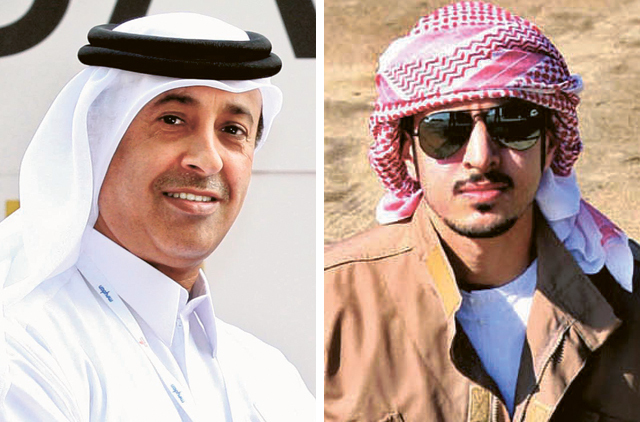 Everyone deserves a chance or an answer, I have got nothing from Emaar management," Bin Theniyah said. He claimed Emaar's refusal was because there was not enough money. "I am not asking for money. On the contrary, I can find sponsors willing to support my bid to raise money for charity, but they [sponsors] said how can we pledge if there is no certain date set for the climb? I am willing to compromise in terms of the party to whom the charity money would go if that is what is required to get the permission," Bin Theniyah said.